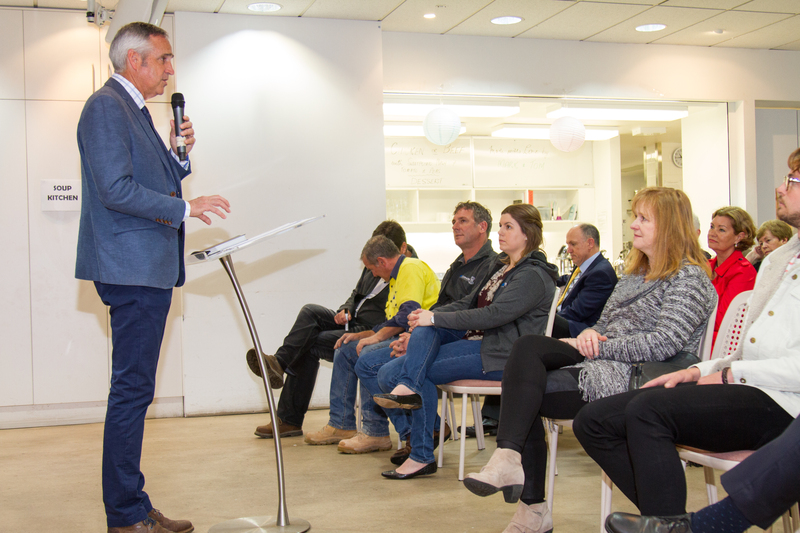 At a ceremony at the Manly Corso on October 4, the congregation of St Matt’s, Manly gathered with members of the community to celebrate the first turning of the sod on a new project. For years, the wardens of St Matt’s have been planning and saving and working hard to ensure that the retail space owned by the church since the 1920s could be upgraded in order to continue serving the community in the future. “It’s the first six shops on the southern side of the Manly Corso,” explains the Rev Bruce Clarke, senior minister at St Matt’s. The redevelopment is expected to take 13 months, weather permitting, and be complete by Christmas 2019. The whole project will cost the church $12 million. “We’ve saved up about $5 million in equity, which has enabled the project to pay for upfront costs as well as assist with loan repayments,” Mr Clarke says. Previously the lower level of the building was leased for retail use, and the top level was kept aside for ministry purposes. When the new building is complete, there will be an additional floor allowing for plenty of ministry to happen above the shops. “We hope to have small group meeting rooms, children’s ministry, youth ministry and ESL on the first floor,” Mr Clarke says. Although the interior will be shiny and new, the facade of the heritage-listed building will remain the same. The finished project will also be christened the Darly Smith Building as a nod to key figures in the history of Manly. Henry Gilbert Smith, known commonly as the father of Manly, made land available for a church in 1857. Captain Benjamin Darly and his family also set aside land on The Corso for a new church building. While this is an exciting project for the benefit of the Manly community, Mr Clarke is most excited about the added ministry possibilities the redevelopment will provide.